The craziness begins today, Cooking Carnival 2016. My Menu for week 1 is Sandwiches. I will posting Sandwich recipes. Yes about 9 different sandwiches, to make your job easy. I have tried my best to keep them simple, no extra effort needed in making them. 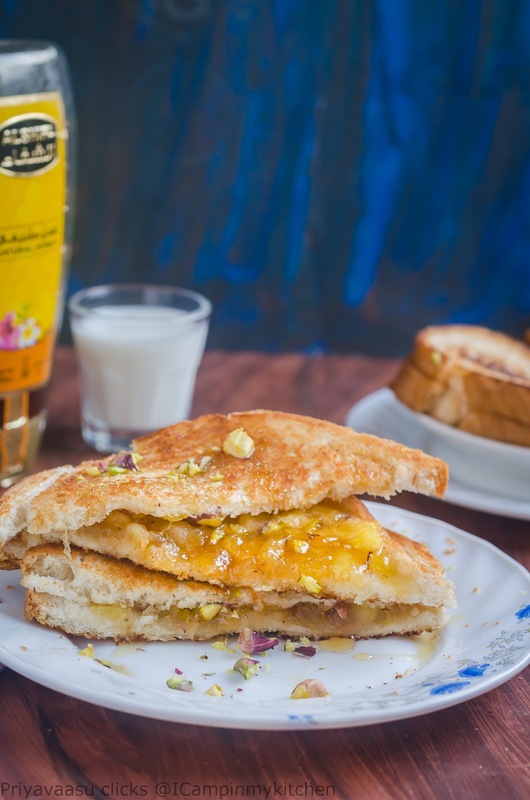 Let us begin with some sweet, today's recipe is an delectable dessert, turned into breakfast. 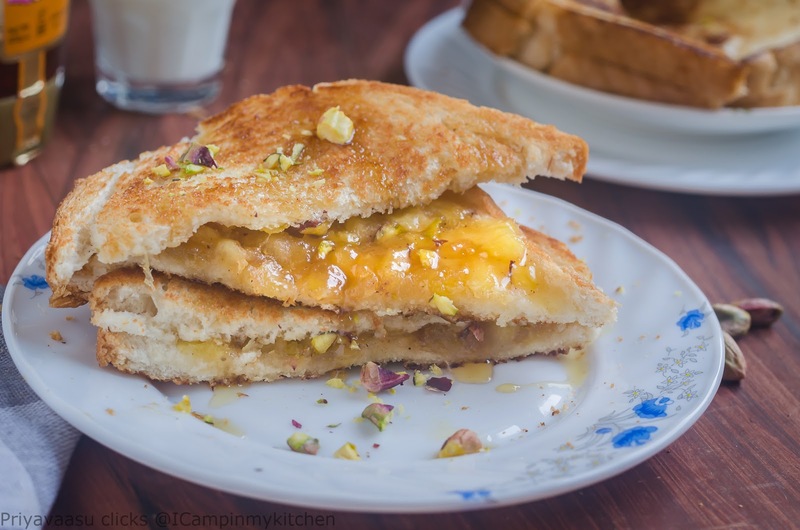 A simple sandwich with apple pie filling, stuffed between slices of bread and toasted crisp with butttterrr! a lip-smacking start to your day! 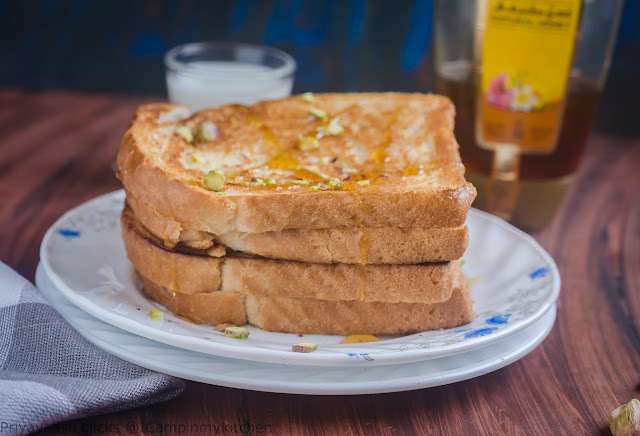 Spread the filling on one side of the bread, sprinkle some nuts, squeeze a little honey, close with another slice. Repeat the same with another slice. Heat a flat pan/tava, toast the sandwich until crisp with butter. Remove the sandwich to a serving plate, squeeze little honey, sprinkle some nuts, and serve. I wouldn't call it a breakfast. It looks like a delicious dessert sandwich and love your snaps so much.. The Apple pie filling is delicious. I would love to have this Sandwich anytime. Wow irresistible looking apple pie sandwich.Lovely choice for the carnival. Love your menu Priya and I know I am going to enjoy your sandwiches too..can't wait for the rest to happen.. Sandwich looks so delicious and tempting.As Gayathri said it looks like dessert sandwich..Looking forward to see your innovative recipes. Very tempting sandwich and a great way to kick off the carnival! Ok same pinch ! But i am doing all sandwiches 26 days ! I simply loved this apple pie sandwich ! Tempting one ! Lip smacking breakfast for those who like to start the day with some sweet. Next time I get apples, am going to try this. Absolutely am in love with your fabulous sandwiches, apple pie sandwich rocks, looking forward for all your dishes Priya. Apple pie sandwich is such a witty idea. Loved the way you made it. Waiting to see what follows in this Marathon! Absolutely divine!! Such a great dish to start the BM with. The clicks look super tempting Pri!! Bookmarked. Sounds delicious and I guess my daughter is going to love this. Wow what an amazing and unique sandwich that is Priya. Love your theme for the week. Looking forward to all your sandwich creations. 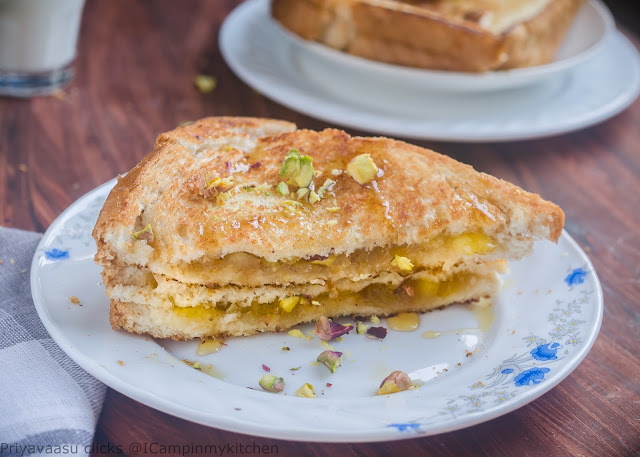 drooling... delicious sweet sandwich recipe. Love your theme.